A rich red oval Ruby surrounded by a halo of Diamonds set into Yellow Gold. A popular stone with a modern, minimal design. The Pendant hangs on a fine 18” (46cm) Yellow Gold chain. 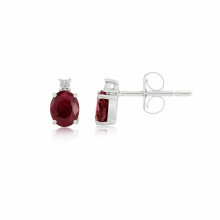 This is a lovely gift piece particularly as Ruby is the birthstone for the month of July.